Instagram recently sparked a social media panic attack when they announced their decision to move from a chronological feed to an algorithmic feed. While this is something that its sister company, Facebook, has done for a while, it didn’t stop people from freaking out. The new feed is still in beta, but once released widespread, it is possible that users will only see up to 30% of the content produced by the people they follow—similar to how Facebook feeds work. The move to algorithmic feeds will allow Instagram to serve users more personalized content suited to their interests. The content users see will be based on their reactions to previous posts; they will see more of the content they like. Marketers need to up their game now. The luxury of chronological feeds meant that your entire follower base had a chance of seeing and engaging with your content. 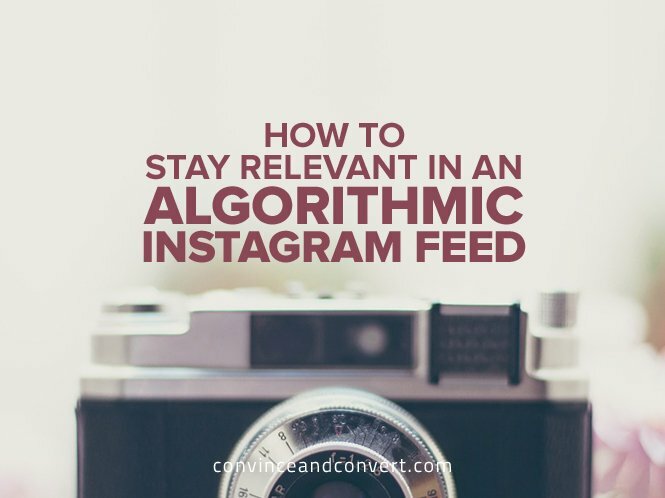 The complexity of algorithmic feeds means that only those who engage with your content (or similar content) will continue to see your content. This puts the onus on us, as marketers, to produce higher quality content. It will keep us accountable, ensuring that we are producing content that is relevant to our audience. Algorithms were built to reward those who created content tailored to their audience. If your content is already resonating, you have no need to panic. If you have been a bit relaxed with your content, now is the time to pull up your socks. Instagram is unique; it is not like other social platforms. Instagram is brimming with different cultures and subcultures. These audiences expect a higher level of authenticity, accessibility, creativity, and relevance. To stay relevant in an algorithmic Instagram world, start with an in-depth understanding of your ideal audience. (highlight to tweet) This is not a place for demographic data—Instagram is centered around culture, interests, and affinities. To demonstrate this, let’s take a look at some of the culture-based communities I’ve identified using Affinio, the marketing intelligence platform. Affinio leverages the social graph to segment and understand audiences through their interests (what they choose to follow). To find out more about how we do this, check this out (Disclosure: I’m part of the Affinio team). Below are overviews of three very different, culture-based communities on Instagram. In the following SlideShares, you can see what each community is interested in, who they are influenced by, how they self-describe, the language they use regularly, and their most-liked posts. This data gives you insight into the culture of each community, providing a cheat sheet for creating content that would resonate with each. These insights show us that these fashionistas prefer a colorless palette when it comes to their fashion. These latte-sipping ladies like their content crisp and clean and are most active at the beginning of the week. Their top influencers include street style fashionistas Jodi Blackburn, Chantal Li, and Chloe Zhaang. Wouldn’t it be lovely to travel around the world and take pictures of all the beautiful things you see? These Instagrammers do just that. There is nothing dull about this community’s content. It’s bright, it’s beautiful, and it’s full of adventure. Their top influencers include adventurers DameTraveler, Brooke Saward, and Liz Carlson. These console gamers are all about posting gaming-related content. Highly active on weekends, these young gamers are likely hitting the books during the week. Their top influencers include top gamers Matthew (nadeshot), Austin Pamaj, and Ian Porter. Armed with this data, marketers are able to create brand content that fits seamlessly with what their target communities are already producing and engaging with. While not everyone likes to see branded content in their feeds, if it is timely and relevant, it is less of a disruption in their feed and is more accepted. To ensure your branded content appears in the feeds of your ideal communities, here are a few tips to follow. Understand the culture, interests, and affinities of your community. Analyze the content that they produce and engage with. Produce data-driven content you know will resonate. Build partnerships with top influencers of your ideal culture community. Staying relevant is all about a foundational understanding of who your audience is. Instagram strategy isn’t just about how old your audience is or where they live; to get Instagram right, you need to fit in with the culture. Understanding the interests, influencers, and content style of your audience is crucial to your success on an algorithmic Instagram. If you create content that is relevant and engaging, the algorithmic feed will work in your favor.